Foul Odors- A persistent foul odor is one of the most common indicators of a septic failure. When too much sludge builds up in your tank, it can cause the stench to leak out into the surrounding area. 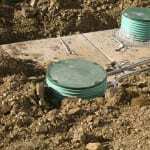 If you notice your home or yard developing an unpleasant smell, we recommend you call our team at Clark Septic to find out whether you need septic tank repair. Sludge Backups- Another sign that you may need septic tank repair is sludge backed up in your toilets or drains. 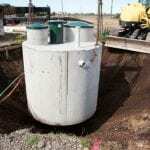 If your septic tank is nearing or exceeding its capacity, sludge from the tank can travel back up into your pipes. This issue can typically be solved with regular tank cleanings, but can also be the result of damage that needs to be repaired. Pooling Water- The third major warning sign that you need septic tank repair is pools of water appearing in your yard, particularly around your tank or drain field. If you notice puddles of water on your lawn, even when it hasn’t rained recently, it’s likely that you have a problem with your drain field. Call our team at Clark Septic to get our professional assessment and solutions.